The storm is expected to bring winds of up to 55 mph, coastal flooding and several inches of snow and rain to New Jersey, Pennsylvania and New York. POINT PLEASANT BEACH, N.J. — A week after Superstorm Sandy pummeled the East Coast, wiping out entire communities, residents were bracing for yet another potentially damaging storm. A nor’easter taking shape Monday in the Gulf of Mexico was expected to begin its march up the coast, eventually passing within 50 to 100 miles of the wounded New Jersey coastline on Wednesday. The storm was expected to bring winds of up to 55 mph, coastal flooding, up to 2 inches of rain along the shore, and several inches of snow to Pennsylvania and New York. One of the biggest fears was that the storm could bring renewed flooding to parts of the shore where Sandy wiped out natural beach defenses and protective dunes. “It’s going to impact areas many areas that were devastated by Sandy. It will not be good,” said Bruce Terry, the lead forecaster for the National Weather Service. Some communities were considering again evacuating neighborhoods that were hit hard by Sandy and where residents had only recently been allowed to return. No town had made a final decision to do so as of mid-afternoon Monday. New York City Mayor Michael Bloomberg decided against a new round of evacuations. 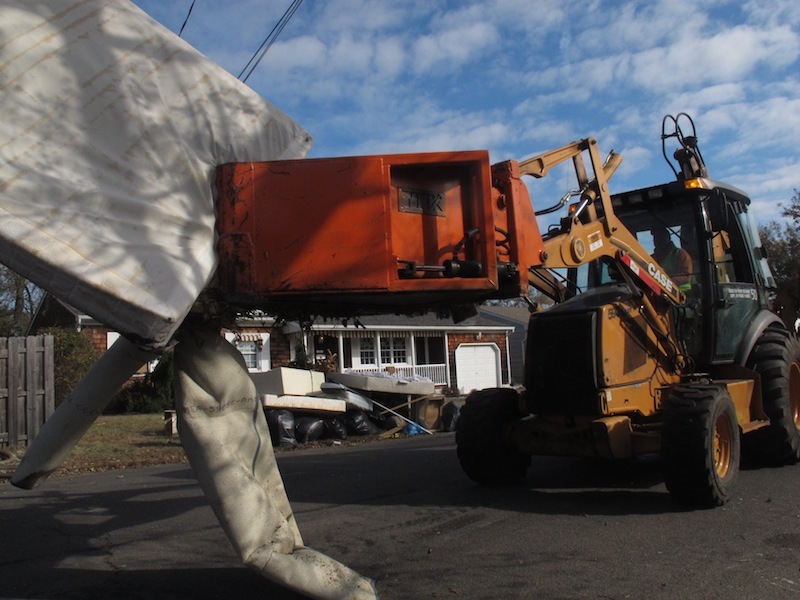 In Point Pleasant Beach, N.J., Laura DiPasquale was frantically going through dozens of black plastic trash bags that volunteers had stuffed full of her household belongings and brought to the curb, trying to make sure nothing she intended to keep had gotten tossed out with debris like waterlogged drywall. Already, she had found treasured Christmas ornaments amid the detritus. People were advising DiPasquale to just let go of most of the stuff in the bags. The new storm was expected to move up the coast Tuesday, past Georgia and South Carolina. By Wednesday morning, it was expected to be off Virginia or Cape Hatteras, N.C.
Terry said the storm could slow down somewhat once it gets off the New Jersey coast, meaning its effects could linger. They include rain, high winds and tidal surges, although less than those that accompanied Sandy. Coastal flood and high wind watches were in effect for parts of Maryland, Delaware, New Jersey and Pennsylvania. On Staten Island in New York City, Irina Vainauskas and her husband survived Sandy even as water reached the third step of the staircase from their living room to their second floor. They went upstairs with food, water and their cats. They’re prepared to do it again, if necessary. “Of course we’re concerned, but we’re just tired to be afraid and to think about everything,” she said in her ravaged living room. 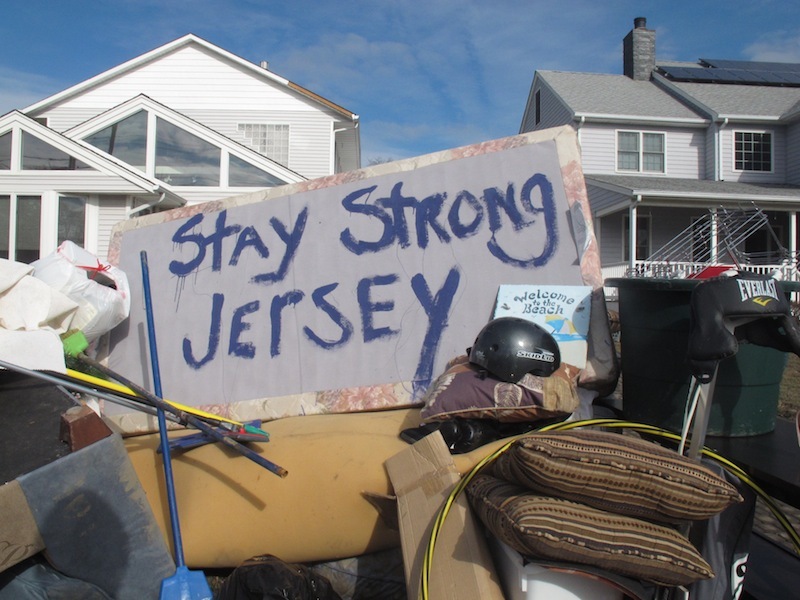 Marilyn Skillender was picking through the pile of her belongings at the curb of her home about two blocks from the ocean in Point Pleasant Beach, worrying about the next storm. She instantly flashed back to a December 1992 nor’easter that pummeled the Jersey shore over two days with widespread flooding and property damage. Her house was inundated in that storm, too. Jim Mauro was one of the few professing not to be overly concerned about the impending nor’easter. A house he owned in Mantoloking was literally wiped off the map by Sandy last week. It wound up in Barnegat Bay.